Nanshi is the collection of narrow streets and alleys once enclosed within the walls of old Shanghai. During the city’s period of foreign concessions, it was the main Chinese district, rarely entered by foreigners. Today, the neighborhood captures the essence of old China, complete with several temples, food vendors, and a crowded bazaar. 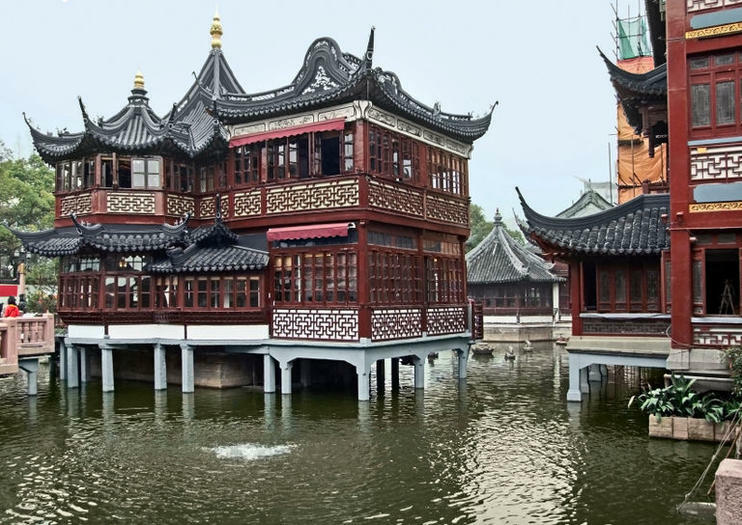 Most visitors to the old city head for Old Street and Yuyuan Garden, a classical garden also known for its bazaar with antiques and tea shops. The streets and alleys radiating out from this center teem with restaurants, curiosity shops, street food vendors, and temples, including the worthwhile Temple of the Town God. Many Shanghai tours include a stop in Shanghai Old Town, as well as the Bund and the Shanghai Museum. You might choose to explore Nanshi on a leisurely private walking tour, or combine a sightseeing tour that includes Nanshi with lunch and a river cruise. Shanghai Old Town is a must-see for first-time visitors, history buffs, and bargain hunters. Wear comfortable shoes suitable for walking over uneven surfaces. If you’re visiting independently, give yourself two to four hours to explore the area. Shanghai Old Town is located southwest of the Bund. The easiest way to get to the neighborhood is to take the subway, line 10 to Yuyuan Garden or line 8 to Dashijie. The best time to visit Shanghai Old Town is on a weekday morning. Weekends tend to be crowded with tourists and shoppers, so plan to arrive early if you’re visiting on a Saturday or Sunday. Garden enthusiasts should aim to visit in early spring, when the trees are budding and the gardens are perhaps at their loveliest. There are several famous Chinese foods associated with the Old Town area, most notably soup dumplings, or xiaolongbao. Be prepared to line up for this street food favorite. After getting your fill, spend some time sipping tea at Huxinting, one of China’s oldest and most famous tea houses, just outside Yuyuan Garden.